Glencoe’s climbing heritage is second to none with both summer rock and winter mountaineering routes in abundance. If you’re a world champion sport climber or just a complete beginner with a passion for trying something new, visit the Ice Factor indoor climbing centre in Kinlochleven. The centre has been a big hit with many of our guests - mostly famililes having a go at a new sport. Chilly evenings on high mountains are no longer essential if you make the most of the superb indoor ice climbing wall! Its also a great place to either fine tune your skills or simply acquire some brand new ones, as instruction and guiding can be arranged. The mountaineer's mountain. The Rannoch Wall and Crowberry Ridge offer spectacular situations with many famous and popular routes set against a back drop of the Rannoch Moor. Agag's Groove and January Jigsaw are names synonymous with the Buachaille, whilst the Crowberry Gully remains a very popular winter gully route on the mountain. A number of easier grade routes make this a popular destination for many climbers discovering the delights of the glen. The Lower and Upper Bow, Quiver Rib and Archer Ridge are some of the highlights on this relatively accessible crag. Several steep walls provide for some harder grade rock climbs but this mountain really comes into its own in winter conditions. Broad Gully is a straight forward snow slope and a popular means of ascent of the peak, or as a descent route for climbers who have completed other climbs. 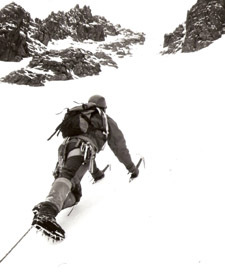 In heavy snow conditions, neighbouring Dorsal Arete is the safer option. Other classic winter routes include SC Gully, Twisting Gully and Boomerang Gully. This is the spectacular face that dominates the view from Clachaig Inn & Chalets. Due to the nature of the terrain, access to/from the routes requires a degree of caution. However, routes such as Big Top and Trapeze are still regarded with some awe and trepidation some 50 years after they were first climbed. In winter, No 6. Gully is an absolute classic. 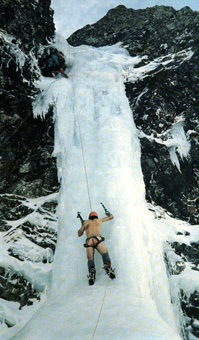 And, of course, the icicle of Elliott's Downfall is a much sought after prize, though we've yet to hear of a second naked ascent as yet! Sit back in Clachaig's Bidean Lounge with your binoculars and a pint, and watch the sport unfold! And of course, not forgetting Clachaig Gully, our very own route from the doorstep. However, the gully is rarely climbed these days. Maybe the idea of wet slimy vegetation covered walls and the occasional rockfall don't have the appeal they once used to! Or maybe folk are just soft these days!